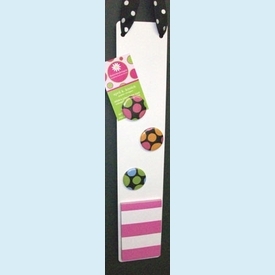 Fun slim and hangable magnetic strip comes with three coordinating big dot circle magnets and a tiny paid of pink striped paper for jotting notes. Perfect for hanging on a door or cabinet knob in the dorm, at home or office. NOTE: Only 3 left! SIZE DIMENSIONS: 3" x 15.5"